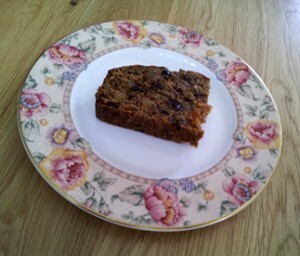 When visiting Wiola and Tom Hola-Peryer, I was offered this unusual but delicious fruit cake. Thinking of you dear members, I asked and received the recipe. Enjoy, I did! 100-175g / 4-6oz stem ginger, drained of syrup, roughly chopped. Preheat the oven to 180oC / 160oC (Fan) / Gas 4. Grease and line a 20cm/8in deep round cake tin. Measure prepared fruit and nuts, butter, bicarbonate of soda, sugar and water into a large pan. Bring up to the boil and boil for 3 minutes. Add the eggs, flour, ground ginger and stem ginger. Mix to thoroughly combine and turn into a prepared tin and level the top. Bake in the preheated oven for about 1 hour 15 mins until golden brown. Cool in the tin before turning out on to a wire rack.